Thinking about one day purchasing land or working out a transfer process with an existing farmer? Hopefully by now you’ve checked out NYFC’s Directory on Land Resources. Right now, we want to highlight some new resources just released by Land for Good, a non-profit organization based in Keene, NH that offers education and assistance to farm seekers, farm families, landowners and communities in New England. Three new (free!) publications from LFG are designed to help senior and junior farming generations get the farm succession process going, from setting goals to understanding legal and financial terms used in farmland and business transfers. They are also valuable resources for service providers who work with these audiences. 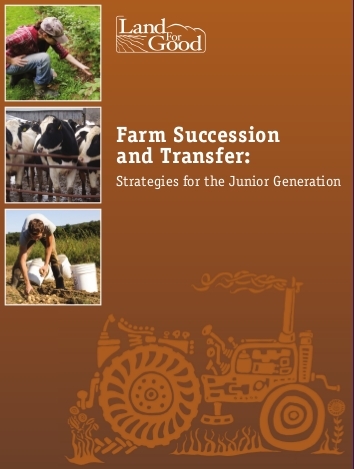 Farm Succession and Transfer: Strategies for the Junior Generation, one of the three guides, focuses the beginning farmer’s side of land transfer, whether it be transfer within a family or from a retiring farmer to a brand-new business. The guide walks through the entire process, starting with developing a business plan and values-statement, then how to assess the opportunities out there and how they fit within your vision. The meat of the guide wades into the technical side, including types of transfer, legal issues that need to be resolved as a contract is worked out, types of agreements to use, and how to develop contingency plans. Sound interesting? Take a look through the guide now, even if you’re not yet ready to begin your search – it could help as you start to develop your initial plans. The second two guides complement the “Junior Generation” guide, with one for senior farmers and one for service providers who will have a role in the process. These are all available for free, so check them out today! « previous article: Update on pro-farmer Tester amendments – it's not too late to take action!